Egrang is traditional game instrument made by two stick (bamboo) with arm's adult size. This game is familiar in Indonesia although some region have a different name and game's characteristics. To play this game, you should walk with this egrang and keep train the body balance and if you have skillful enough, you should run faster to win the game.Enjoy new sensation playing this game by making your own egrang. 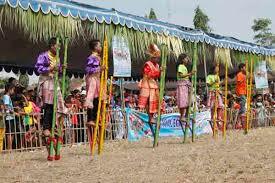 Two bamboos 2 - 3 meters length depend on your body tall. 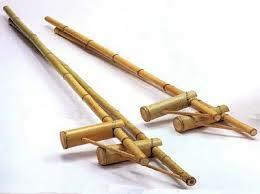 Two bamboo sticks 30 cm length to make foothold ( design the stick in order to comfort into your feet). Make punch at the bottom side. If you have a good skill, you may punch higher , but if just beginner make it 1 feet height. Do the same with second bamboo. Plug the bamboo’s stick to the hole and do it being powerful foothold and make sure not broken when you train to run faster. It's nailed if necessary.